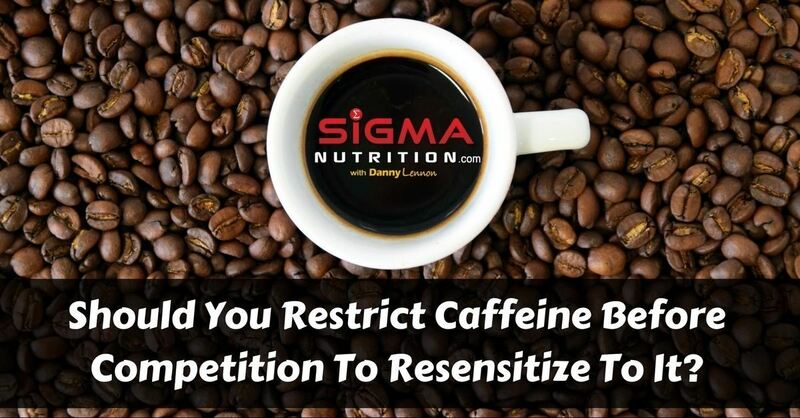 I recently received an email from someone who had purchased the Sigma Weight Cutting System for MMA & Boxing, asking why I had advised athletes stop caffeine consumption in the final 7-10 days before competition. This is an interesting one because my stance has slightly changed on this matter in recent times. So I’d like to outline both my original thinking, and some opposing thoughts, in this piece. As you already likely know, caffeine is quite the stimulant. And its effects are very quickly noticeable. And the literature supporting it’s beneficial impacts on strength  , endurance  and sports performance   is pretty extensive. It can even allow for better training performance when you are tired or short on sleep . Or specific to the demographic in the question, we have data showing it’s benefit for grip strength, jump height and power production in elite level Brazilian Jiu-Jitsu (BJJ) athletes . However, one potential mitigating factor is our ability to increase our tolerance to caffeine. Essentially, the more consistently we consume caffeine, the less sensitive we are to it’s physiological effects. So originally the idea behind caffeine withdrawal in the week or so leading up to competition was to “re-sensitize” the athlete to the effects of caffeine. By not having any for a period, they can shake off the caffeine tolerance they have built up, and therefore will be more readily influenced by the caffeine when they take it before the competition (a fight in this particular scenario). This is similarl to what is often done with endurance sport athletes; where athletes will stop taking caffeine a week or two before an event so they can re-sensitize. However, whilst it’s clear that people do build up a tolerance and you are more stimulated by caffeine after not taking it for a while, there is relatively recent research suggesting that it might not actually matter for sports performance. The 2017 study out of Brazil  showed that the performance effects of acute caffeine supplementation during an 30-min cycling time trial were not influenced by the level of amount of caffeine that the athletes habitually consumed. Unsurprisingly, they found that time trial performance was significantly improved with caffeine ingestion compared to both placebo and control conditions. However, the cyclists habitual caffeine intake had no impact on performance, suggesting that you can get a performance benefit from acute caffeine ingestion pre-performance regardless of whether you’re habitual caffeine intake is high or low. So at least when it comes to endurance time trial performance, there may not be as compelling a need to reduce caffeine intake in the lead up to an event as we may have assumed. And sure enough we have conflicting evidence. For example, people who typically consume very little caffeine may be susceptible to having performance benefits mitigated by caffeine tolerance if they start habitually consuming even relatively low amounts of caffeine. First they had these people do two trials at the start of the study; one done after consuming an acute 3 mg/kg dose of caffeine, and one done after consuming a placebo. The trial was 60 min cycle exercise at 60% V̇O2peak followed by a 30 min performance task. As you might presume, all participants produced more work when they consumed caffeine, rather than a placebo, in these initial trials. Then they underwent a 28 day period of either consuming 1.5 – 3.0 mg/kg/d of caffeine or a placebo. This was followed by another VO2 peak test on day 29, this time supplemented with an acute 3 mg/kg dose of caffeine before the test. The original performance benefit that caffeine had given was no longer apparent after 4 weeks of caffeine supplementation, but the benefit was retained in the group taking the placebo for the 28 days instead. So perhaps for people with low habitual intakes, if they are planning on using caffeine to boost performance pre-competition, they might be best served by staying away from it in the week(s) leading up to it. But what about in other sports or performance markers? Would the results of this study carry over to a combat sports athlete? Or a strength sport athlete? There are lots of answers you are probably quite rightly asking. Right now, I guess it’s still up for debate. We could probably go back on forth on studies in much greater detail, and get into the weeds of each one. That’s probably best left for another time, and perhaps for someone who is much more deeply entrenched in the caffeine and sports performance literature. This post is not intended to be a literature review of this topic. So I want to leave aside studies for a moment. Rather I want to focus on some interesting questions for practitioners and considerations for practical implementation that actually address the question sent in the original email. Benefit of Placebo: As some athletes may notice an elevated “buzz” or stimulation from caffeine pre-fight by coming off it for a week, that can also impart a benefit via the placebo effect. Which can have very real benefits. In fact just believing that caffeine will improve performance may boost the beneficial effect you get from caffeine . So even if a period of caffeine restriction to re-sensitize the athlete to its effects is not necessary for athletic performance (still debatable), there still may be a benefit to having that restriction if it causes them to feel more stimulated on its re-introduction, and thus believe that it is really going to boost their physical performance. Diuretic Action: For athletes cutting weight for a weight-class based event, there is a solid case one could make that taking caffeine in the final days of a weight cut can be useful as caffeine acts as a diuretic. So maybe it could be useful to increase water losses. However, note that this would only be the case for caffeine pills being used whilst water is being restricted, as using coffee would lead to net hydration as the amount of water in a typical coffee would outweigh the water losses the caffeine in the coffee would induce. Additionally, trying to quantify such a diuretic effect is hard, so I can’t know how much of a real-world effect it would have. So I personally wouldn’t put too much faith in this particular tactic during a weight cut. Caffeine Withdrawal Symptoms: The other thing to consider is how stressful the caffeine withdrawal is likely to be for the athlete. For some of my fighters who like to continue drinking coffee during the weight cut (as they enjoy it and it helps with their hunger), and get stressed by not being able to have it, then those athletes continue consuming it. Caffeine withdrawal affects people differently, but for frequent high-dose consumers its not uncommon to see symptoms like anxiety, irritability and headaches . Not exactly what you want an athlete experiencing in the lead up to competition, especially whilst also trying to cut weight! In conclusion, as we see over and over again in nutrition, we are lacking one true definitive answer. There is rarely ever one answer, rather there are simply trade-offs. So use this information and your own experiences and expertise to weigh-up those trade-offs and make what you feel is most likely the correct decision in each case. As of right now, if it’s easy for the athlete to do and doesn’t present any negative symptoms, reducing caffeine intake in the final week or so pre-fight may be a worthwhile strategy, as at best it will confer a physiological advantage leading to better performance, and at worst will either have no effect or even a slight benefit via the placebo effect. With the reduced training intensity in this final week, there is no need for pre-workout stimulants or caffeine supplementation, so the only challenging thing to modify is coffee intake. For a number of the athletes, they will continue to have one coffee each morning but leave it at that. Some athletes prefer to completely restrict. Often times things like that are capable of giving a mental advantage. We already have research showing that just the act of cutting weight makes athletes feel more like “real athletes” and gives them identity. Similarly, I’ve seen athletes who sacrifice the most in terms of food choices actually feel more primed to succeed. It feeds into their belief that they are willing to do what others won’t. For some athletes, restricting caffeine can play into that. I wouldn’t be surprised if we saw more conclusive data suggesting restricting caffeine and re-senstizing an athlete to caffeine has no actual benefit for performance on re-introduction. But as of right now, because of some uncertainty, and the clear potential for a placebo effect to be at play, I think it’s fair for practitioners to decide to hedge their bets and at least trial new athletes with caffeine restriction to see how they feel. However, it is my opinion that if caffeine restricition causes any issues for the athlete (stress, anxiety, headache, irritability, etc. ), then it’s not worth doing, as the evidence for doing so isn’t strong. I’d love to hear any anecdotal reports from those of you who are athletes who do this, or if you are a coach who recommends (or does not recommend) such a guideline.